What I like making stir-fry dishes is that I can use endless combinations of ingredients. 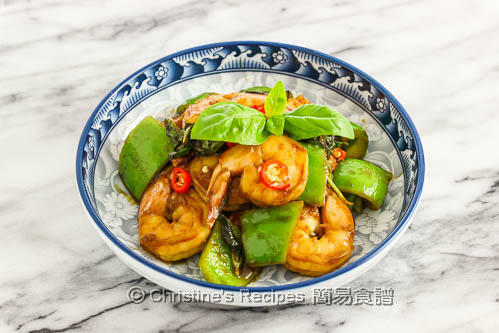 The stir-fried prawns were paired with some condiments often used in Asian cooking. If you have Thai or Taiwanese basil, feel free to use them. I just picked some sweet basil from my backyard. Its sweet fragrance penetrates the prawn meat and will make you feel very refreshing. The sweet soy sauce used is called ABC, has a unique malty flavour. Just browsing the ingredient list in the recipe, will it make you feel like to give it a go? Peel and devein the prawns. Mix with the cornflour and salt. Set aside for 10 minutes. Rinse the prawns with running cold water and pat dry with kitchen paper. Season with salt and pepper. Set aside. Heat oil in a frying pan over medium-high heat. 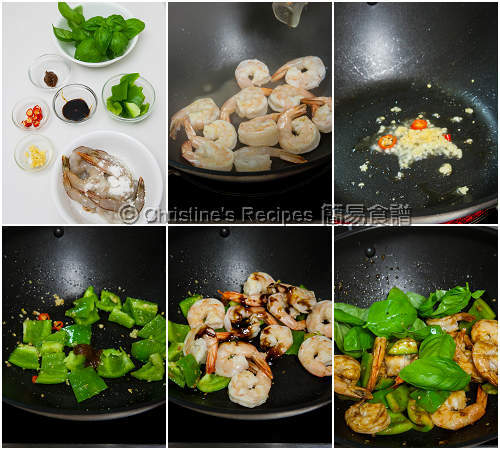 Cook the prawns in one single layer, until both sides change colour. Sprinkle wine. Stir to combine. Set aside. Add in a little of oil in the pan. Saute garlic and chilli. Add the capsicum and stir fry. Pour in the chicken stock. Toss back the prawns. Stir in sweet soy sauce and Tamarind puree. Quickly combine. Taste and season with salt if needed. Turn off the heat. Stir in the basil leaves. Done. Serve immediately. By mixing the prawns with cornflour and salt for a while, then rinsing with cold water, it helps the prawn meat to keep smooth and crunchy. The brand of sweet soy sauce is called ABC that I used to make the satay sauce. See the picture there. Tamarind puree is made from tamarind fruit that tastes slightly sour and just right to balance the sweetness and saltiness of soy sauce. It takes the whole dish up a level. It’s available at Asian grocers. 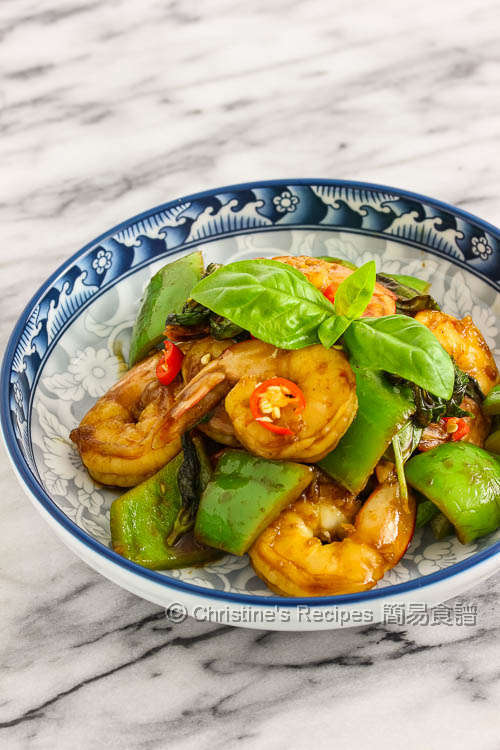 A healthy and very delicious stirfry!